Bio Water Power extract cooling sunscreen SPF 56 PA ++ is a water-based formula which provide skin with high sun protection with an invisibly light finish. Specially formulated with Bio-Essence miracle Bio water which is low in mineral contents and rich in trace minerals, this sunscreen instantly provides 2x cooling and moisturizing effect on the skin . it is further enriched with hyaluronic acid that effectively lovks in moisture to provide deep hydration . After application, skin feels cool, moisturized and hydrated even after long hours of sun exposure. Also, i personally like it very much because it makes my skin looks bright and it is very effective when i am exposed to the sun . i would recommand this product to both ladies and gentleman and it is especially great for a hot and humid weather like singapore. The sun seemed to be out everyday . 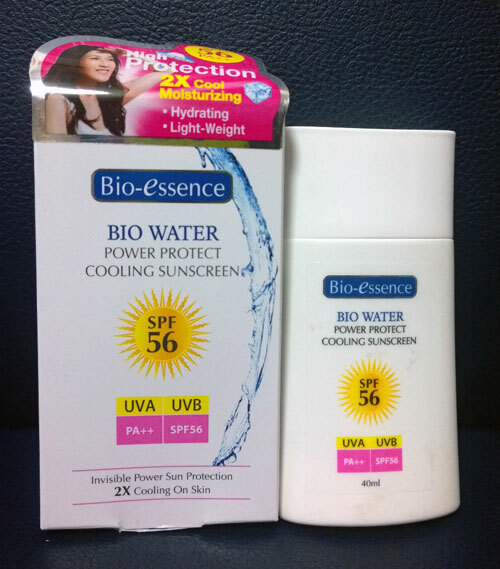 so it is good to equip with a non-greasy sunblock like Bio-essence Bio Water Power protect sunscreen, have you got yours yet?